To use this template please see the talk page. ...that GLaDOS', Turrets' and Caroline's voice actor, Ellen McLain, also voices the Administrator in Team Fortress 2 and the Overwatch in the Half-Life 2 series? ...that GLaDOS stands for Genetic Lifeform and Disk Operating System? ...that Ellen McLain is also an opera singer and sang the Turret Opera? ...that Valve employee Richard Lord was the original, placeholder voice for Wheatley? ...that Portal 2 originally wasn't going to have portals? ...that there were plans for "sticky gel" in Portal 2? ...that both Portal and Portal 2 derived many of their ideas from prototypes made by Digipen students? 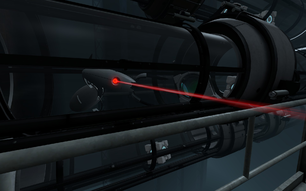 ...that the cake in Portal is a Black Forest cake that project lead Kim Swift chose at a nearby bakery? This page was last modified on 16 November 2012, at 05:12.